Beautiful Shea ranch home with many upgrades in the exclusive, gated community of BackCountry. Relax in your main floor master w/vaulted ceiling, 5 pc. spa-like bathrm w/large shower. Youâll enjoy cooking and entertaining in the gourmet kitchen with ss appliances, double oven, built-in microwave, Masterpiece cherry cabinets with soft-close doors, pull-out drawers & walk-in pantry. Hunter Douglas âNew Styleâ shutters on all windows, ceiling speakers throughout, and lots of high-end granite, marble and tile finish. Enjoy the professionally landscaped backyard w/flagstone patio, surrounding evergreens, perennials, and pre-installed gas line for your bbq. This is an intentionally designed low maintenance home. The flagstone patio and landscaping cover most of the backyard, so thereâs little to mow. The front driveway is relatively short (but still accommodates guest parking), faces west which minimizes snow shoveling. 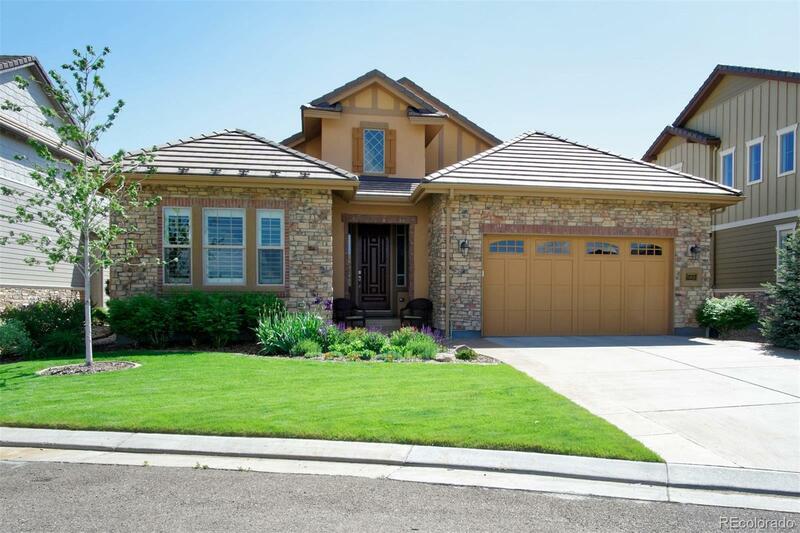 Luxury, low maintenance and energy-efficient - this is Colorado living! Basement Ceiling Height: 8' 7"